Before the rise of the Millennials in 2017, for many of us, generational nicknames were unknown territory. Now they’re used in sales meetings, design profiles, user journeys and marketing techniques in every industry as the world tries to cater for every generation of consumer. But what exactly do they mean? How is a Gen X different from a Gen Z? What’s an Alpha and how do we work with them? Does the Silent Generation still exist? So many questions with so few answers. With so much to unpack, I thought I would break down each different generation, exploring their terminology, characteristics and key demographic profiles, helping all of us to understand the generational gaps just a little better! The Silent Gen demographic cohort is the oldest living generation, born just after the stresses of significant historical events i.e. The Great Depression and the Korean War. Named as the ‘Silent Generation’ due to their pacifist nature and reluctance to get involved in activist movements of the time, they were generally conservative throughout their adult life. Silent Gen adults are traditionalists, romantically attached to the ‘old ways’ of doing things. Brought up hardworking and committed, they are generally a polite and conscientious cohort, usually working in upper management and senior positions in companies. Due to post-war idealisms circulating through their childhoods, the Silent Generation is grateful and respectful of the positions they hold – whether that be a family, a home, a car or a job. They are also incredibly loyal workers, perhaps due to their inbuilt gratitude supply, and thrifty when it comes to resources, making them great team members and managers. Your Silent Gen workers might suffer a few drawbacks, however, when it comes to to evolution of your company, with new technologies, processes and ideologies becoming counter-balanced to their way of working. Baby Boomers are one of the most prominent demographic cohort, making up the majority of parents, grandparents and industry builders in society today. Their adulthood, bookended by the end of World War II and the rise of domestic technology, was one of great change and adaptability, with new morals and lifestyles emerging throughout. 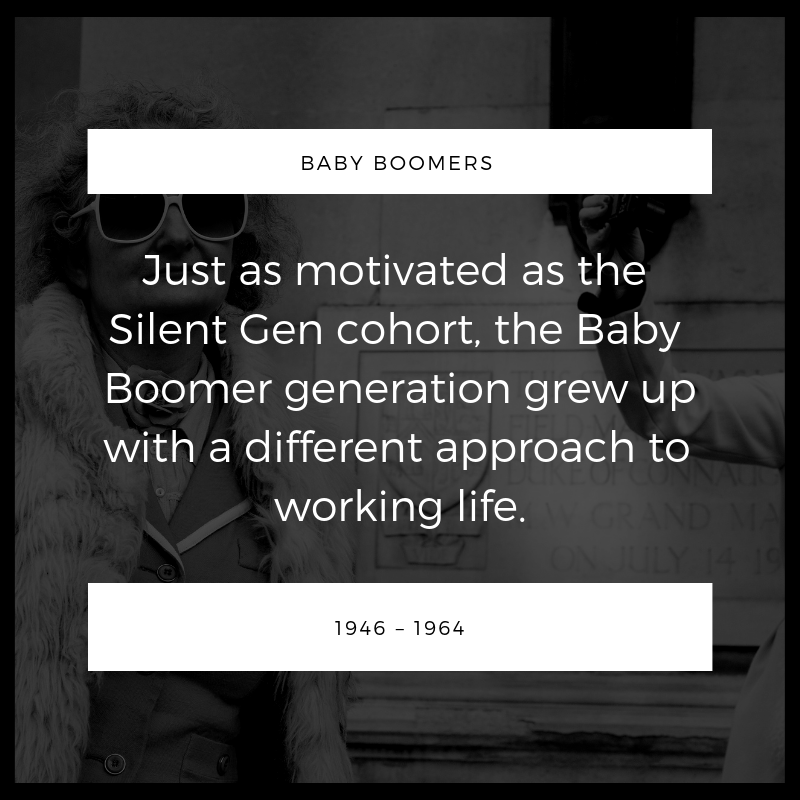 Just as motivated as the Silent Gen cohort, the Baby Boomer generation grew up with a different approach to working life. Confident and self-reliant, they will typically thrive in more independent roles, striving for new goals and achievements regularly. Though confident, they may suffer some conflicts in the workplace, with self-value replacing company loyalty and Baby Boomers are a naturally competitive group, with the potential to cause friction with less aggressive colleagues. One of the most ethnically diverse cohorts, the Gen X demographic grew up through an era of high divorce rates, unconventional family dynamics and minority empowerment. Seeing in major developments in technology yet tough economic times, Generation X introduced a new way of working, living and making an income – through online and digital professions. They are also one of the least likely generations to fall into debt, due to the good economic practice installed into them by previously financial strained generations. Less loyal to a singular employer than previous generations, Gen X workers are known for their freedom in experimenting with different sectors, industries and roles. Notably flexible and tolerant of different lifestyles, they are the most sociable generation, connecting well within a big or small team. They are also defined by the phrase ‘live to work rather than work to live’ as they value their home and domestic life just as equally as their professional one. Spending quality time with their friends and family matters just as much as hitting deadlines and professional goal hitting. So if you’re employing a Gen X, be prepared to allow them a little informal breathing space for much needed ‘family time’! Generation Y, or ‘Millennials’ are currently the biggest demographic alive today. Made up of the Gen X and Baby Boomer offspring, they are extremely tech savvy and will heavily incorporate technology into every aspect of their daily lives. Having lived through several big political and social changes, this cohort is proudly activist, championing significant progression in terms of equality and diversity! Despite their generation’s decreasing rates of marriage, family is still a vital part of the Millennial lifestyle, often being prioritised over work or study. Parented by technology, they are an intelligent, adaptable and skilled workforce, utilising a big range of workplace skills in their everyday lives. They are also the generation most likely to be working multiple jobs or ‘side hustles’ to boost their own income outside of full time work. Highly team based, Generation Y has the ability to be confident, dedication and loyal, however they are also more sensitive to criticism and mental health problems than any other generation. As an employer, empathy is going to play a big role in managing your Millennial employees, and hearing their side of the story is going to be increasingly important in keeping them happy! The youngest generation in our workplaces, Generation Z is comprised of teens and young adults, born into the cyber and technological world. Growing up in modern and liberal households, this generation is unquestioningly equality-driven, without being exposed to many of the discriminations of the past. Motivated by near-celebrity influencers, this generation is likely to suffer from economic issues and self-confidence issues with digital idols being their biggest influences. Quite like the Millennial generation, this cohort could be overly cautious and self-conscious in their approach to work. However they are also likely to be workers eager to learn, being more aware than ever of the high expectations placed on their demographic. Having grown up with little economic security, they will also be useful when it comes to conserving resource, coming full circle to the Silent Generation.